“He who sells what isn’t his’n. That old horse chestnut was used to frighten the Rothchildian short-sellers that used to hang out on the old New York “curb” back before governments and influence- peddling lobbyists conspired to change the rules. I used to love to find overvalued stocks or commodities and get our trading desk to call over to the loan post to see what it would cost to borrow a few thousand shares of some pumped up bowser of a stock and then attempt to catch it on an uptick in order to sell it. The entire concept was rather civilized because everyone would know that there was a highly visible bear out there trying to get short something and invariably, the principals like the CEO or CFO would find out and then the ancient game of cat-and-mouse would begin. It would begin with the phone calls from someone at the target company introducing themselves and asking you out for coffee or a beer if you were borrowing a puny 2,000 shares with the venue morphing decidedly if the number was north of 100,000 shares. (If it was a MILLION, it was a weekend in Vegas.) I would put on my most gracious persona as the rep from the overvalued company tried in vain to change my intention of hammering his pig of a stock into the ground, but what made it a study in human behavior was that the higher the gratuity, the more maniacally I wanted to sell the stock. Needless to say, short-selling is not the fun it used to be because everyone and their uncle are “hip” to the notion of shorting overvalued garbage thanks to terrific books and movies like “The Big Short” that really showed the world how extremely difficult it can be and how the market-makers can artificially create a squeeze on a short player by simply fiddling with the “marks” at the end of every month. I, for one, long for the old days of finding some piece of Vancouver garbage that had a $500,000 annual travel and entertainment budget and a $500 annual exploration budget and a property “next door to Friedland” (!) whose founders held all the one-cent stock that was coming out of escrow next week. Adding insult to injury and turning the ridiculous to the sublime, the CEO has just paid out an egregious amount of money and stock to the telephone room owners whose job it was to “pump up the volume.” Alas, the Elon Musks of the world learned how to magnificently “manage” their stocks by way of social media and sweetheart deals with all the top 50 hedge fund managers that conspire daily to monitor the share price so that nothing “untoward” can ever happen to threaten the uptrend line, despite being the most over-priced, money-losing auto manufacturer in world history. The same thing goes for gold and silver with massive quantities of paper gold being traded as if in a virtual reality pit of digital outcry. To say that being long the gold and silver markets since 2013 has been “interesting” is like saying that having root canal surgery without Novocain is “interesting,” when we both know that the proper descriptive should be “agony” or “maddening” but one adjective to most-accurately describe these past five years of shenanigans is “costly” for many people and for all the wrong reasons. Banks cannot sanction gold or silver because there is no counterparty to the transaction. Once it leaves the bank, it is gone. I have one idea for all of you that is, in my humble opinion, one of the greatest “short” set-ups that I have seen in over 40 years trading markets. Because I am leery of interventions and manipulations carried out constantly under the blinded eyes of regulators, I need to short something that would not be exposed to directional risk. 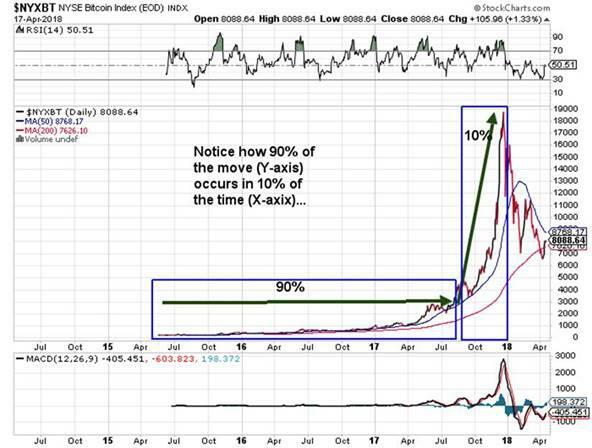 The best example of being right about something and wrong at the same time was mid-2017 when I took one look at Bitcoin and determined that it was a bubble of the highest order. That was at $10,000 per coin. It went to $19,891 and then got bombed to under $7,000 and had we shorted it in mid-year, we still would have made money but had we shorted it on December 19, we would have made a fortune. What I knew from my short-selling experiences on the Nikkei in the late 1980s was that the most difficult part of shorting is execution (TIMING) because the biggest move on a chart comes in the last 10% of its journey along the x-axis. (Classic “bubble” chart pattern). Getting back to my version of “The Big Short,” I would not want to EVER be on the other side of a Goldman “mark” (where they could arbitrarily price your position wherever they want) and we all saw how much pain they went through until the subprime bubble was finally pricked. Instead, I like the idea of risk arbitrage, something I studied at the Wharton School in 1985 with a certain professor named Dr. Jeremy Siegel. Finding relationships between two assets that are either inordinately stretched or compressed can provide the most comfortable returns imaginable when they normalize. If there are two car companies and one is trading at 22 times earnings and the other is at 11 times earnings and they are both pretty much the same in terms of market share and growth, then being short the former and long the latter eliminates the need to be right about the direction of the automotive sector or the broad market a whole. Similarly, if live hog futures are priced too far above live cattle futures, demand for pork declines and demand for beef increases, causing the spread to narrow. Now, it doesn’t matter if human meat consumption shifts in favor of fish and chicken and BOTH pork and beef decline, live hogs will crash harder than live cattle and you will have made a lot of money. So, the Great Debate amongst the stock and USD bulls is that with the weekly chart showing RSI in the 37 range and with MACD and the Histograms turning up off a deep trough seen in February, the USD is going to rally. 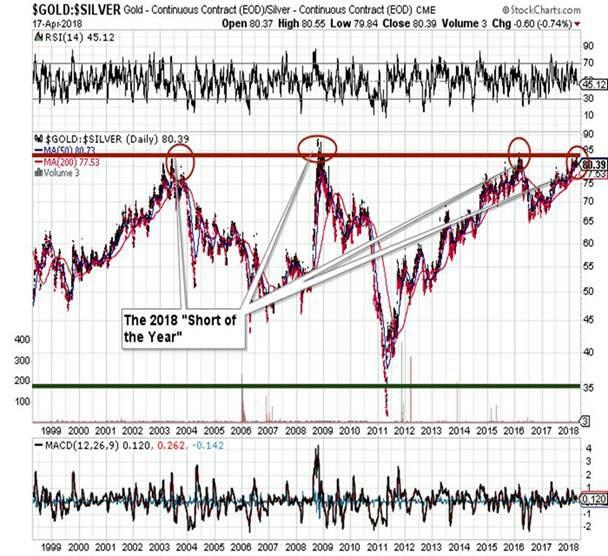 Since gold (and silver) are negatively correlated to the USD, is there not a hidden land mine under the metals despite an excellent COT structure and positive technical? The answer is “Maybe” so in order to take the directional risk out of the metals, what is it here in April 2018 that resembles an aberration of sorts? Surely it is the real dollar prices of silver and gold relative to equities and relative to Bitcoin and relative to Toronto real estate that remain an aberration—BUT—even greater than these disparities is the value of silver relative to gold—OR—the Gold-to-Silver-Ratio (GTSR)! USD rallies hard; stocks explode to new highs; commodities crash; gold and silver decline; GLD is at $107.75; SLV is at $15.35; GTSR is at 70. Gold and silver under Assumption B have 15.6% and 2.8% declines and the trade remains profitable. Because the relationship between gold and silver was stretched, the directional risk was removed from the initial trade set-up. 1991 – When silver hit its lows, the ratio peaked at 100. End of 19th Century – The nearly universal, fixed ratio of 15 came to a close with the end of the bi-metallism era. 323 B.C. – The ratio stood at <12.5 upon the death of Alexander the Great. You have all read my missives on gold and silver and stocks and bonds and the VIX and my dog and my two vices until you all basically know me better than my own children so know this: shorting the GTSR is the best, low-risk trade you can ever get in today’s algo-driven world. As you all know, I took my VIX profits in February and as huge as they were, they did not allow me to parlay the winning in their entirety to my beloved silver. I had to think about what would happen if I was wrong (God forbid) so I put 25% into Fortuna Silver May $5 calls and 25% into the SLV June $15 and $15.50 calls at various prices lower than here. The problem is that since those two positions represent only a portion of the profits on the UVXY trade ($9.38 to $25 in eighteen days), I still have the principal to put to work and I really did not want to give back those winnings as I have done countlessly since 2011. So I scoured around my thumb-drive memory stick of all the “Greatest Trades of History” and found things like U.S. Secretary of State William H. Seward’s purchase of Alaska from the Russians for $7.2 million and the Dutch West India Company’s Peter Minuit buying Manhattan for “60 gilders” worth of “sophisticated modern (then) European tools” worth (possibly) U.S.$15,000 and, of course, the now-famous “Big Short” trades in the sub-prime derivatives in 2008 and George Soros’ short of the British pound in 1992 (which George would say “broke the Bank of England” but actually simply forced it to abandon the European “Exchange Rate Mechanism”). These were all “great trades” but what earns them “legendary” status is that they were at once both laughably unpopular and comically contrarian (as was buying the UVXY in late January). Going against the crowd is not very much fun. It is psychologically taxing and emotionally draining. Nevertheless, I believe that the gold-silver “pair” is going to be a shockingly good trade and I have gone “ALL-IN” with my remaining VIX profits and whatever else I can muster after the lawyers and accountants and CRA (and ex-wives) have had their way with me. So, do your best to look deep into the inner vault of psychological awareness and assess, as I have, what, pray tell, might be the reason that we all take hard-earned, after-tax dollars and try to be heroes. I know I have taken risk throughout my life and in my career so now is the time to invest with “the house.” The current market environment is nothing more and nothing less than a “sanctioned casino” and I might add that it has “forward guidance” in respect of “future actions” that are in demonstrative favor of “the house,” so while I love buying “20 cars of beans” or a “sliver of silver futures,” the trade I am taking shown above will be a huge winner, on a risk-adjusted basis. Invest with “the House” that HATES gold and cares NOTHING of silver. If you do, you are long “the House.” Not such a bad trade.